In October 2017, Dell Medical School opened UT Health Austin, a set of clinics and care teams designed around health conditions. The initial set of clinics focused on conditions most impacting health across Travis County. 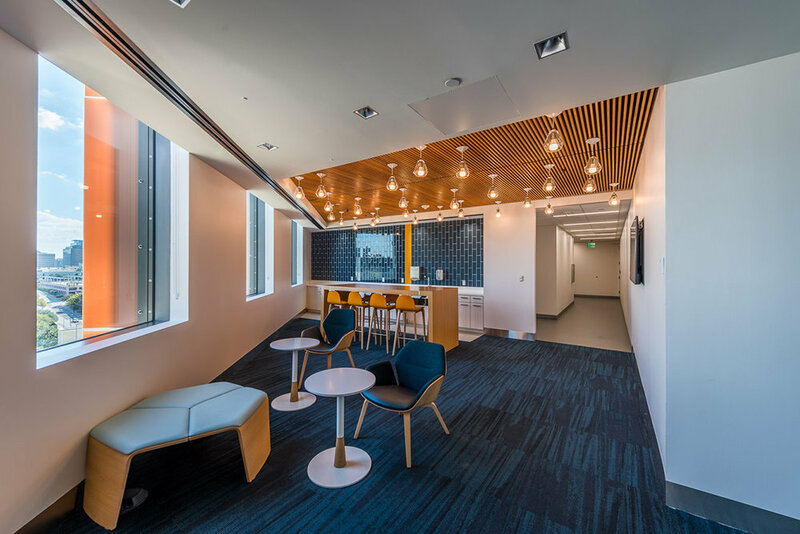 We collaborated on the space design, service design, tool design, and systems design to co-create an entirely new experience centered around people: patients, caregivers, and providers. Clinics are driven by a fee-for-service model that fails everyone. How might we create a fundamentally different experience? Create a clinic where providers collaborate with each other and the patient on better health outcomes. Start by defining the experience principles for patients and providers. Patient-centered environments improve care experiences. The clinics reorient the experience and provoke entirely new relationships between patients and providers, within care teams, and most importantly, between a patient and their role in their health. By eliminating waiting rooms, patients take the first step toward being self-enabled by navigating to their room. Patients and caregivers experience quiet, calming, spacious areas that do not feel clinical. Patient rooms are designed to enhance shared decision making between the patient and care team with all seating at the same level and a large wall mounted digital screen that's easy for all to see together. The care team approach coordinates care that is centered around the patient. A care team comprised of physicians, nurses, therapists, social workers and more collaborate in a shared workspace which creates a hub for the entire care team to work together. Everyone involved is focused on health outcomes. It’s hard to overcome legacy behavior. It’s human nature for people to confuse current practices with best practices. When you are launching a new model of care, the experience principles serve as a guidepost to navigating change. When things get hard, people naturally revert to the way they’ve always done things rather than turning to the experience principles. A good strategy would be to form a core group of ambassadors across the provider teams who are deeply committed to the principles, and who frequently reintroduce the principles and why they matter. Designing a new space that solves legacy problems is also disorienting because it’s so different. We ended up designing adaptations (concierge, talking walls, etc.) to address the engrained model of waiting rooms. Every exam room is equipped with a centrally located, large screen to enable shared decision making, but it's a new and uncomfortable experience for both providers and patients to be so transparent and see together what’s going into the electronic health record.